Vibrant bougainvillea flowers tumble down around the beautiful and peaceful 14th century cloisters attached to the church of San Francesco. The architecture is what makes for its beauty, a mixture of styles and periods; rounded arches on two sides and interlaced Arabic ones on the other two. The cloister is the evocative setting for summer concerts and theatrical presentations – make this a must if you can. The Sedile Dominova, in the piazza of the same name, this 15th century building is still the place to congregate, especially in the evening, around the umbrella topped tables under the softly lit frescoes. The picturesque open loggia with its arches, balustrades and green and yellow tile cupola was once used by the nobility as an assembly hall. 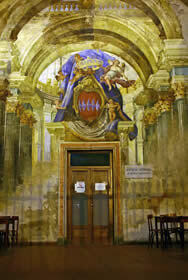 The exterior frescoes which include the coats of arms of local families, are still able to be seen in its arches. One of Sorrento’s most tranquil spots, this tree lined park overlooks Marina Piccola and the Bay of Naples in the distance. The views are especially spectacular in the evening when the colors of the sky and water change with the sunset. This is the perfect place to just sit and watch the comings and goings at the Marina below. This museum is Sorrento’s most important. Situated in an attractive ancient villa, the collection is comprised primarily of 17th-19th century objets d’art including furnishings, china, ceramics and glassware. There is a fine collection of paintings by Neapolitan and international artists at the museum as well. Overflowing with colorful caffes, Stil Liberty (Italian Art Nouveau) buildings, horse drawn carriages clip clopping by, and filled with people both day and night, this is the “place to be”. In the center of it all is the statue of Torquato Tasso himself, the great poet was born in Sorrento in 1544 and died in Rome in 1595, just before he was to be crowned poet laureate. At the northeast corner where it merges into Corso Italia is the church of Maria del Carmine, done in gleaming white and yellow stucco, inside you will find 18th century tabernacles set on display in gilded cases and the fine ceiling painting of the Virgin Mary. Following a cobbled lane, to the west of the town, you are lead from Capo di Sorrento to Punta del Capo, here you can visit Bagno della Regina Giovanna, the Roman ruins of what has once the home of a wealthy citizen, Pollius Felix. This archaeological site which sits close to the water’s edge is surrounded by trees and herein we find a small rocky cove where the sea enters through an arch, making it a sheltered swimming spot. Above this, Roman walls and the remains of an under-floor heating system are the only remains of the ancient villa. To the west of the town centre is the picturesque Marina Grande filled with fishing boats bobbing gently in the calm water. The colorful houses lining the waterfront add to its charm. The deeper waters of the nearby Marina Piccola make for a more hectic port. 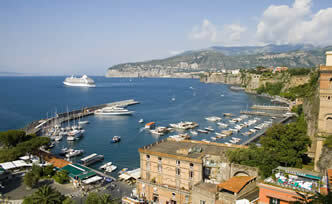 Boats leave here for Naples, Capri and in the summer months for the Amalfi Coast. This private museum is home to a collection of fine examples of the Sorrento tradition of inlaying wood, examples of which are found in its cathedrals. Here you will find furniture and natural and stained wooden objects from the 17th to 20th century. Not to be missed are the impressively decorated ceilings in two of the rooms. A favorite retreat of the Roman emperors Augustus and Tiberius and one of the most celebrated islands in the Mediterranean, Capri is easily reached by ferry or hydrofoil from Sorrento. 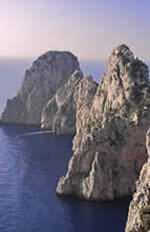 Tucked between two mountains, the village of Capri is linked together by hilly streets, olive groves and garden terraces. 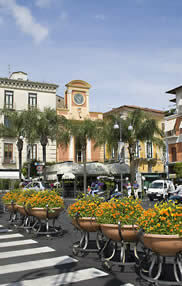 The heart of the village is Piazza Umberto, where people gather at shops and cafes. Stroll through the lively piazza by the church of Santo Stefano and the 12th century Palazzo Cerio. By night, the solitude of the island gives way to a lively and beautifully lit piazzetta. By day a boat trip leaving from the Marina Grande can take you to explore the fabled Grotta Azzurra (Blue Grotto), Capri’s greatest natural wonder.